Once upon a time…there was an annual “Ann Arbor Medieval Festival,” a community event which featured many types of performances including plays, music, combat, and dancing. One year (1976) as the festival came to a close, the members of the Morris dance group said to one another, “We’re having too much fun to stop now – let’s do this year ’round!” And, with that utterance, Ann Arbor Morris was born. 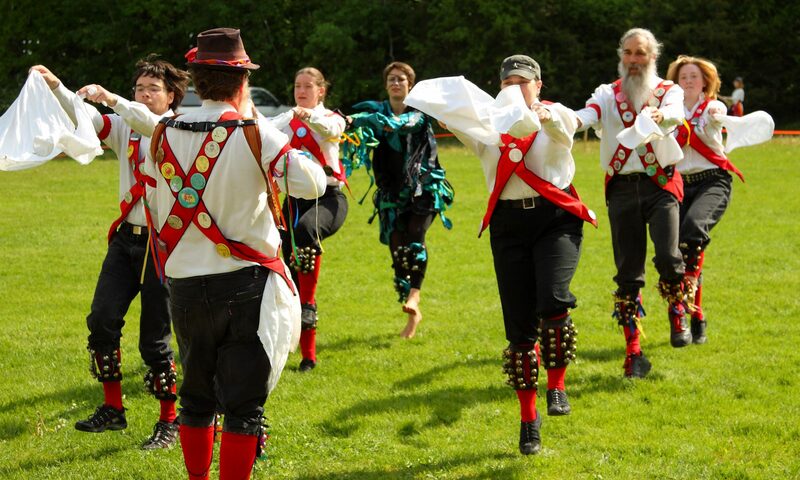 Since then we have performed traditional English Morris dances in the streets of Ann Arbor and elsewhere. May Day – We dance the sun up every year without fail on May 1st. Look for us at 6:15am in Nichols Arboretum, at the overlook down the road from the Geddes Rd. entrance, rain or shine. Dancing in the Streets – Sponsored by our parent organization AACTMAD, this free event showcases many local dance groups with performances, workshops, and open dancing. Held in the streets of downtown Ann Arbor on the Sunday of Labor Day weekend. We don’t always make it, but we’re there in spirit! To reach us regarding attending practice, booking requests, or general inquiries, email a2morris@umich.edu. You can also reach us through our Meetups.